The world's leading retailer giant Wal-Mart has seen the establishment of the first branch of the Communist Party of China (CPC) and the first branch of the Communist Youth League of China (CYLC) in one of its outlets in the northeastern city of Shenyang, capital of Liaoning Province. A local CPC committee official announced on Thursday that the Party branch and the youth league branch were both established in the Shenyang Wal-Mart Department Store on August 12. A trade union was also set up in the Shenyang outlet on the same day. Employees at the Wal-Mart store will now have access to CPC membership. This is the first CPC branch and CYLC branch to set up in the 22 Wal-Mart outlets in China that have established trade unions, said Chen Lie, head of the Organization Department of the Dongda District Committee of the CPC. But Chen did not explain why they did not publicize the information on the date when the CPC and CYLC branches were established. 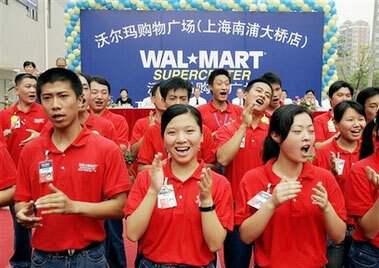 Wal-Mart has set up 59 outlets in 30 Chinese cities since it entered China in 1996. It has more than 23,000 employees in China, including over 700 in Shenyang.